This month we focussed on using the Eloqua Campaign Canvas to fulfil your event registration needs. In addition, we discussed the release of the new Email Design Editor, changes to the LinkedIn Campaign Manager App and more. The Event Module, a paid for add-on or included in Eloqua Standard & Enterprise Editions. Most of our customers use the Campaign Canvas to deliver event registration campaigns. The Event Module is helpful however, there are some limitations. Time zone complexity is one, with all times set to US East Coast time. For this user group meeting, we focussed on the Campaign Canvas. We started with a scenario – a single event in a single city/location. For the purpose of this user group, we used the above scenario as a guide. The other important part that was discussed is the need for a robust and agreed on naming convention. This is covered in more detail in the webinar replay. The event registration process will include a number of areas across Eloqua to help you deliver the best possible experience. The slide above shows you each of those areas and is a guide outlining what you would need if your event registration campaign required the capturing of RSVPs or simple registration. A number of people had questions about the new responsive Design Editor, one specific question related to the “lifespan” of the current Eloqua Email Editor. We were uncertain during the webinar, however, Richard Lee from Oracle provided the detail below from Topliners. Q. Are you getting rid of the Classic Design Editor? When? What happens to my emails created in the Classic Design Editor? This update from Oracle possibly raises a few more questions than it answers. For example, if you currently create emails in DreamWeaver and upload them to Eloqua – how will that work? We don’t have specific answers to that question, however, it would seem that over the coming months and releases of Eloqua, the new Design Editor with receive enhancements to cater for these and other popular features you currently use. 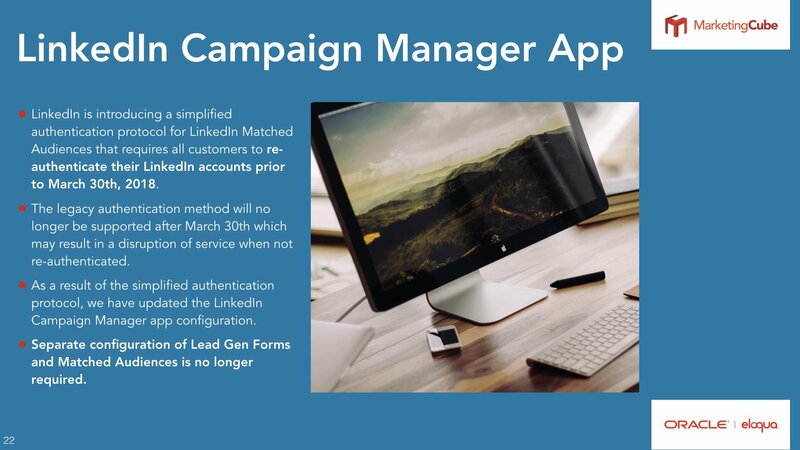 IMPORTANT: You need to re-authenticate your LinkedIn Campaign Manager App credentials by 30th March 2018. If you’re currently using the LinkedIn Campaign Manager App, your Eloqua Administrator will need to ensure the app is re-authenticated. Click on the image below for more details.